My family has owned a working cattle ranch for as long as I can remember. The cattle were left to openly graze through the pastures and wander about the ranch, to the fishing pond and beyond. I can remember countless times driving in only to be stopped by a cow standing blatantly in the middle of the road munching on some mesquite. A few months ago, the decision was made to slowly get rid of the cattle on the ranch. Why you ask? For one, the expense it costs to maintain such a production is becoming more than the profit. The cattle are eating everything in sight, not allowing the wild game to acquire enough to eat to reach their full mass potential. This essentially decreases the amount of hunting leases the ranch receives, since the game isn’t at its full potential, size wise. As long as the cows continue to eat, they’ll also continue to erode everything in sight, especially since they’ve been grazing for so long out in the pastures. And specifically speaking of extreme heat waves, I can remember a few times in my lifetime when we’ve had cows die right in the pastures as a result of the brutal Texas heat. That seems to be a pretty clear indicator of the serious catastrophic risks that the effects of warming have on the hard-working cattle ranchers. So how does this story tie in with the facts? The result of these alterations mentioned above as related to the effects of climate change has been known to alter milk and meat production, meat quality, and species reproduction. This is a very real occurrence folks. The cows just aren’t as healthy any more, and the expense to keep them so is only growing. The profits returned from a cow who suffers from heat exhaustion and dehydration are less than desirable, considering the amount of money that was pumped in initially. Climate change also affects the water supply, which indirectly affects the amount of irrigation that is allotted for agricultural purposes as well as the cattle. 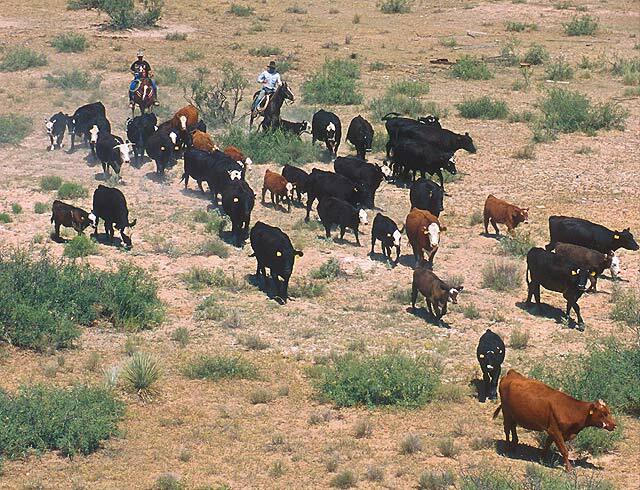 In addition, grass growth and the effective distribution of the pasture and the animals who depend upon the grazing lands in Texas become compromised. So, since the cattle on our land take up so much of the pastures and open land space, our family business is forced to compromise and only produce cattle, when the land could also very well be utilized for growing crops like alfalfa, cabbage, lettuce, etc. But since the cattle hog all that precious land space, this is no longer a possibility. Not to mention, pest infestation risks are also greater in warmer climates…and those Texas summers are brutal enough already! With that being said, if climate change continues to present unfavorable conditions for livestock production, it has been suggested that ranchers may in fact need to adjust the number of cattle on their ranch (like my family’s situation-how ironic! ), the time of grazing, and even the genetic composition of the cattle! We can do anything these days, so why not just add some more GMOs to our meat. Can’t hurt, right? After all, it’ll make them more suited to these new, more extreme environmental conditions. So…no worries. Lately, we proud citizens of Texas have been experiencing many floods and droughts throughout the years. Drought can be detrimental to the cattle population as well. Drought causes a lack of safe water accessibility for the cattle drinking it, leading to the production of unhealthy cows, who in turn do not provide healthy milk for our young human population. As we are already dealing with an increase in warming and a shift in climate conditions, it is also worth noting that as our own population increases, the agricultural and livestock industry is only going to grow as well. In addition to our human induced warming, a continued growth in livestock production will only exert more pressure on our ecosystems, the biodiversity, the land, our forest resources, and water quality, all the while contributing to more warming, as we continue to contribute as well. So if all of this is happening on a quaint family cattle ranch, can you imagine the circumstances on an overpopulated factory farm? I can only imagine the conditions they’re in. Plus, it’s important to realize that all these current studies being conducted refer to TODAY’S agricultural and livestock conditions, not tomorrow’s. Now just imagine: a world of tomorrow with more population, way more cows to feed our population, more warming, less water supply and access to other natural resources, and perhaps a completely different economy. There is much to be considered to maintain the health and safety of our human population for the future. Part of this starts by learning how to successfully manage the health and ever changing conditions of the food we eat.